Violet & Bobby Nest-Watch: Baby Hawk Spotted! On Heels of “Riverside Dad” Hawk Death, Can We Rid Washington Square of Hazardous Rodenticide? Defying the “experts” who stated last week that it was not going to happen for hawk couple Violet and Bobby, according to the New York Times, a baby hawk has hatched from one of the three eggs in their nest above Washington Square! This news comes on the heels of the death of “Riverside Dad” hawk at Riverside Park in late April who likely ate a poisoned rat, despite pleas to the Parks Department to stop placing rodenticide there. This new birth brings up a pertinent issue that has been addressed before on this blog and elsewhere: what about that rodenticide in our city parks? I am writing to you about NYU’s redtailed Hawks, Bobby and Violet, and the danger to them posed by the rat poison currently stashed all around Washington Square Park. I am an assistant professor at NYU, but I write you now as one of the many city birders. Rat poisons, even “the second generation” poisons currently in use by the city, are fatal to Red Tails and their nestlings. There have been many instances of Red Tails killed by these poisons. In 2008 it was documented that the entire hatch of 3 nestlings died because they were fed just such poisoned flesh by their by unknowing parents. Just this week the NYC birding community witnessed the death of the male of the beloved pair at Riverside park; he died because he ate a poisoned rat, leaving behind a mate and at least two nestlings, who are now in eminent peril, as she cannot feed the fledglings and herself for the months it will take them to reach adulthood. You can read about it here at the noted website, http://www.palemale.com. I am asking if we– the NYU community, the Parks Department, the NYTimes Cityblogs– can come together to take steps to protect Bobby and Violet from a similar tragedy. The territory in which they hunt and feed is so small that it is only a matter of time before one of them ingests the flesh of a poisoned rat and is killed or inadvertently kills their offspring. For the hawks’ sake we should take measures to protect them. We should be unequivocally diligent in our stewardship of our local, wild neighbors and our shared environment. With the hawks now visible on a broader stage through the webcam, this concern is magnified many times, as the hawk watchers who have grown to love them will be brokenhearted to lose them, let alone find that they were lost even though their deaths were preventable. There are many things that can be done to protect the adult hawks and the nestlings from rat poisoning. The first is removal of the poison from the area during nesting season. The Parks department has done this before for Central Park Hawks, so the possibility is there. Better sanitation practices around the park is an important longterm solution. This would mean that the businesses and buildings in the area use rat proof garbage containers with lids. I understand that last night a nestling was finally sighted in the nest bowl, and that it looks like we are going to be able to watch our first hawk family grow in Washington Square Park over the summer. Right now we have a real chance to avert tragedy by rallying in support of this wondrous, wild happening unfolding before our eyes. It [he] is confirmed dead since Sunday. [He] has been sent for testing already. It will be difficult for the mother to do everything, keeping babies warm and dry and getting enough food but we will see. I will assist if asked to. On April 11th, I had warned John Herrold that his staff was negligent by putting out poisons at the Boat Basin Dumpsters in late March. He took no action until he was contacted by Commissioner Benepe days later. His failure to acknowledge that he ignored my email and then his stating “We in Riverside Park are especially proud to have these beautiful creatures living in the park, and take great care to protect them.” infuriated me. Absolute B.S., when you’ve most likely just killed one of them. Let’s get the rodenticide removed in Washington Square, now. 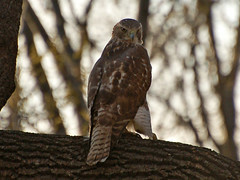 WSP Blog post from May 13th, 2008: Riverside Park’s 3 Baby Hawks Believed Dead; Pesticides in Parks the Cause? Riverside Park’s Three Baby Hawks Believed Dead — Pesticides in Parks the Cause? The New York Times reports this morning that the three baby Red-Tailed Hawks, that were big enough to spread their wings but had not yet left the nest, are no longer in their nest and believed to be dead. One dead “chick” was found on a path at Riverside Park and is being sent to New York State DEC’s (Department of Environmental Conservation) Ward Stone who runs the Wildlife Pathology Unit there and is considered the ‘go to’ person on these matters. Stone will determine the cause of death. It is speculated that the birds may have been fed by their parents a rat or pigeon that had previously ingested poison. This is not the first time poison put down in our Parks has come into question. In 2002, the New York Daily News reported that some of the eastern screech owls which were reintroduced into Central Park were dying from pesticides. It’s a concern that the same fate afflicted three baby red-tailed hawks in Riverside Park. You can read the first version of the Times’ story which appeared on the City Room Blog (with some interesting reader comments) here. May 14: All three chicks have been found and are dead. I’ll post once cause of death is confirmed.